This weekend potentially marks Jake and my's last weekend as renters. On Thursday of next week, if everything goes according to plan, we'll be homeowners. First, let me tell you - I watch A LOT of HGTV and still had no idea what all went into a closing. For example, who knew you had to get home owners insurance before closing? Not me! Good thing I asked because we called and got that done today. Our agent has been amazing though. Anytime I email her a question, she gets back to me ASAP with an answer. She is very experienced and has continued to get us good deals even after the contract - through the inspection, closing, etc. If anyone is in the market for a realtor, let me know and I'll give you her number. She is very well known in Memphis. So since this is the last weekend before we move (knock on wood), we had to get a few things for the house that we'll need ASAP. We currently have a double bed that I had in college. Since both dogs sleep with us, things get very crowded. I saw a commercial for Macy's Columbus Day sale and so we went to Macy's when Jake got off work today. We ended up getting a 1700$ Sealy Plush mattress for $699. It is SO comfortable. Since we got the mattress, we needed to get bedding for it. I'm notoriously cheap and won't buy much full price. Thus, we went in search of a bargain. Enter Stein Mart. Went to Stein Mart, they were having a "12 hour sale" (who knew those existed? What if you come 12 hours and one minute after the sale started?) and so we scored some 350 thread count sheets (2 sets) for 35.99$. One set is giraffe print and one is chocolate colored. If you know me, you know I have an odd obsession for giraffe print - it is my only true tacky chic decoration in the house (see this post about our giraffe chair). I am going to put my giraffe chair in our master bedroom and have the giraffe sheets. Our comforter is a deep red that is the same color as the shades going in that room (that are in the living room, pictured in the post I linked above) and we're debating between tan and a dusty turqouise for the walls. 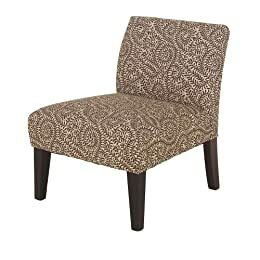 On the way out of Target (where we got our red comforter cover), we spotted this chair: I remembered that Target has a 15% off sale online for their furniture PLUS free shipping on orders over 125$, so I went online when I got home and ordered them. We got two chairs, which we'll put in the living room with the loveseat from our sofa set we currently have. We saved $100 by ordering online and the free shipping. What a deal! After going to 6 stores in 4 hours, Jake said that we'd been shopping too much for his liking and so we decided to go home. He couldn't keep up with a pro shopper, I guess. So my question to you is - after reading about our bedroom idea for the giraffe with red comforter and shades, should we get risky and try to paint the walls a muted turquoise or go safe with a coffee color? I need your help! Comment away.